We have already trained more than 100 junior software engineers. After 12 weeks of learning top technologies, 420 hours of mentored training, creating 7 projects, succeeding at 5 one-day hackathons, and presenting their final six-week project at the Demo Day, the students are ready to seamlessly fit into their new workplace. Would you like to be the first to hire them? Our graduates are passionate hardworking developers . They learnt the top skills and best practices. They have shown a great eagerness to strive in the tech environment by doing their best during an intense 3-month fulltime coding bootcamp. The students come from diverse professional paths - marketing, law, business, operations and more - and combine their experience with programming skills. They learn how to collaborate in software development teams from day one. We teach our students to think like software engineers. Our graduates know how to keep on learning so that they never become obsolete. With their can do attitude they are commited to succeed. Our students have gone through an interview-based selection process and a steep learning curve. We know our students well - we have been with them at every step of their developer journey. This allows you to significantly shorten the interview process. Let us know who you are looking for and we point you in the right direction. 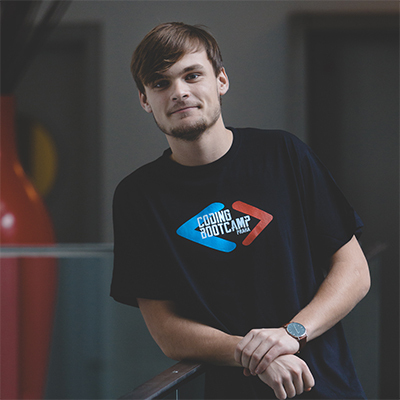 We work closely with employers and our experience shows that the companies who are most engaged with our students get the most interest from them and from the partnership with the Coding Bootcamp Praha. There are a number of ways to get involved, including providing mentors for our hackathons, organising a workshop, inviting students for an open day at your company, sponsoring a scholarship, joining one of our social activities, and participating at our Demo Days. 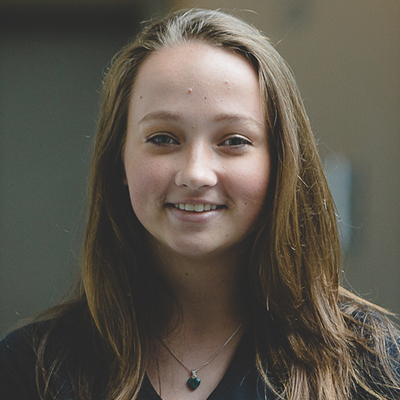 Elena - PHP developer at Startupjobs.cz - signed up for the bootcamp right after high school. 5 hackathon projects, 2 main portfolio projects and numerous exercises. From the beginning, our students are building real-world applications in teams, from a web-based game to a full stack app with external API's. The journey at the Coding Bootcamp Praha starts already before the Day 1 with our intense pre-bootcamp studies. During the bootcamp, our students focus on learning directly applicable skills. Check out the full syllabus for details on the tech stack we teach. Thank you for your interest in the Coding Bootcamp Praha! Can't find an email from us? Poskytnutím e-mailové adresy vyjadřujete svůj souhlas s Všeobecnými podmínkami..
One in four adults reports a mismatch between the skills they have and the skills they need for their current job. Many of our graduates worked in non-technical positions at tech companies or corporation. 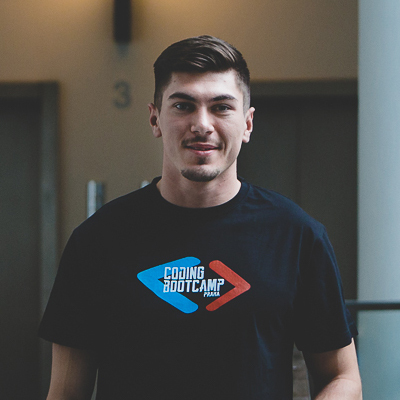 Joining the Coding Bootcamp Praha empowered them to either perform more efficiently at their current job or switch into the company development team. Providing growth opportunities is identified as one of the key factors in providing a great employee experience. We have heard the same story over and over again from our students - they left their job because it's not creative, it got repetitive and they do not feel like they are growing their skills. 94% employees would stay at a company longer if it invested in their careers. We believe everyone should have equal access to learning programming. Sponsor a scholarship for any group of people that you feel should get supported on their journey into tech - including your current employees. Enable your current employees to re-skill by partially or fully sponsoring their student fee. Coding bootcamps have become the new MBA for many of our graduates. Want to join the Coding Bootcamp Praha network?